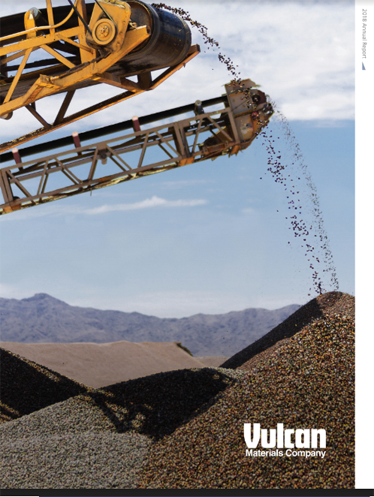 BIRMINGHAM, Ala., July 31, 2018 /PRNewswire/ -- Vulcan Materials Company (NYSE: VMC), the nation's largest producer of construction aggregates, today announced results for the second quarter ended June 30, 2018. Second quarter net earnings were $160 million. Earnings from continuing operations of $160 million compared favorably to $112 million in the prior year period. Adjusted earnings from continuing operations were $1.23 per diluted share versus $0.90 per share in the prior year's second quarter. Adjusted EBITDA increased 13 percent to $325 million. The Company reported 11 percent growth in gross profit led by a 13 percent increase in its core Aggregates segment. Aggregates shipments increased 15 percent (11 percent on a same-store basis) and aggregates average selling price, adjusted for mix, rose 3 percent over the prior year. A 30 percent increase in diesel cost per gallon lowered Aggregates segment gross profit by $7 million. Despite this headwind, second quarter Aggregates segment gross profit increased to $283 million and cash gross profit, on a same-store basis, was $6.55 per ton. Year-to-date, the flow-through rate on same-store incremental segment sales excluding freight and delivery was 43 percent, or 56 percent excluding the impact of higher diesel fuel costs. Tom Hill, Chairman and Chief Executive Officer, said, "We remain on track with our full year expectations. Vulcan-served markets are experiencing stronger growth in demand than other markets, and higher public funding for transportation infrastructure is now converting to higher shipments of aggregates. Apart from geographic mix impacts, our pricing momentum continues to strengthen, including in our backlogged work. Our operating disciplines remain strong, and margins should continue to improve as we turn the corner on costs related to last year's storms. "We expect the strong aggregates shipment growth seen in the second quarter to continue for the balance of the year. We now project full year same-store shipment growth of between 7 and 9 percent, albeit at a lower-priced geographic mix. We reiterate our full-year expectations for 2018 earnings from continuing operations of between $4.00 and $4.65 per diluted share and Adjusted EBITDA of between $1.15 and $1.25 billion." Segment gross profit through the first half of the year remains on track with full year expectations, despite higher than expected diesel cost. Second quarter Aggregates segment gross profit increased 13 percent to $283 million, or $5.16 per ton. Second quarter aggregates shipments increased 15 percent (11 percent on a same-store basis) versus the prior year quarter. Same-store daily shipment rates for aggregates were strong throughout the quarter, reflecting solid underlying demand, including sustained strength in public construction activity. Many of the Company's markets are finally seeing the conversion of higher public funding for transportation into higher shipments of aggregates. Despite the overall shipment growth reported for the second quarter, shipments in some markets, notably California, do not yet reflect the strength in highway construction activity we see building into 2019 and beyond. For the quarter, freight-adjusted average sales price for aggregates increased 1 percent versus the prior year quarter, with the rate negatively impacted by relatively faster growth in relatively lower-priced markets. Excluding this mix impact, aggregates price increased 3 percent. California, Georgia and Virginia realized mid-to-high single digit price growth while prices in Alabama, Arizona and Illinois decreased modestly versus the prior year. Reported freight-adjusted pricing in long-haul markets, where locally available aggregates are not available, was negatively impacted by higher distribution costs versus the prior year. Over time, these higher distribution costs will be recovered in higher prices. Additionally, positive trends in backlogged project work along with demand visibility, customer confidence, rising diesel prices, and logistics constraints support continued upward pricing movements for the remainder of the year and into 2019. Same-store unit cost of sales (freight-adjusted) increased 1 percent versus the prior year quarter as fixed cost leverage and other operating efficiencies mostly offset the 30 percent increase in the unit cost for diesel fuel. Excluding the impact of higher diesel prices, same-store unit costs improved 1 percent compared to the prior year. Through June, the Company also continued to experience higher than normal distribution costs due in part to last year's storm events. During the second quarter, the Company completed the dredging of its coastal Texas port facilities and took possession of the second of its new, more efficient Panamax-class ships. The Company's Aggregates segment gross profit flow-through rate has begun to move towards longer-term expectations of 60 percent. Through the first half of 2018, same-store incremental gross profit was 43 percent of incremental segment sales excluding freight and delivery, and 56 percent excluding the impact of higher unit prices for diesel fuel – despite the negative impact of geographic mix on these period-over-period comparisons. Although quarterly gross profit flow-through rates can vary widely from quarter to quarter, the Company expects continued improvement in the second half of the year. Asphalt segment gross profit of $26 million was $3 million lower than the prior year quarter due to lower material margins. On a same-store basis, shipments increased 3 percent from the prior year. Although same-store asphalt mix selling prices increased 4 percent, a 28 percent increase in unit costs for liquid asphalt compressed margins. Year-to-date, higher liquid asphalt costs have negatively affected segment earnings by $16 million. Although Asphalt segment material margins may improve in the second half of the year, the Company expects them to remain below beginning-of-year expectations. Concrete segment gross profit of $13 million was $4 million higher than the prior year quarter. Same-store shipments increased 10 percent year-over-year. Same-store average price increases of 3 percent allowed for a 3 percent gain in the material margins. Through the first half of 2018, Concrete segment gross profit is in line with Company expectations. During the second quarter, the Company invested $41 million on core operating and maintenance capital, in line with expectations. The Company continues to expect core operating and maintenance capital spending for the full year of approximately $250 million. For 2018, we expect the business to generate approximately $825 million of after-tax cash flows from earnings (defined as EBITDA less working capital growth, operating and maintenance capital, and cash taxes). With disciplined capital deployment and compounding improvements in unit margins, our aggregates-centric business model should enable further significant gains in after-tax cash flows from earnings as the recovery moves forward. The Company's capital allocation priorities remain unchanged, as does its intent to maintain an investment-grade credit rating. During the quarter, the Company invested $77 million in internal growth capital projects. Current projects underway include securing new aggregates reserves, developing new production sites, enhancing the Company's distribution capabilities, and selectively expanding asphalt and concrete production capabilities. The Company plans for $350 million in internal growth capital expenditures during 2018 and anticipates a significantly lower figure for 2019. The Company completed three bolt-on acquisitions during the first half of the year for total consideration of $219 million. These acquisitions complement Vulcan's existing positions in Alabama, California and Texas. The Company also divested its Georgia ready-mixed concrete operations during the first half of the year. SAG expenses in the quarter were $89 million, $6 million higher than the prior year. The year-over-year increase primarily was attributable to acquired operations and the timing of certain accruals. On a trailing-twelve-month basis, SAG expense as a percentage of total revenues declined from 8.7 percent to 7.9 percent. Full year expectations for SAG expense remain unchanged at $335 million. Other operating expense was $6 million in the second quarter compared to $18 million in the prior year that included $15 million of charges associated with previously divested operations. Over the past five years, other operating expenses, excluding discrete items, have averaged approximately $3 to $4 million per quarter. Other nonoperating income of $3.3 million reflects the adoption of ASU 2017-07 relating to the required presentation of certain benefit plan costs. For the second quarter, this adoption increased cost of revenues and SAG by $3.6 million and $0.5 million, respectively, with a corresponding benefit to nonoperating income. Prior period figures have also been revised. Although this change in presentation has no net impact on net earnings or EBITDA, it does impact period-over-period comparisons of segment profitability. The full year projected effective tax rate remains 20 percent and full year projected cash taxes are approximately $75 million before the effects of debt refinancing actions, use of various credits, and refunds from prior period overpayments. Regarding the Company's earnings outlook for 2018, Mr. Hill stated, "Our business is positioned for continued shipment growth, compounding pricing improvements, and further gains in unit profitability in the second half of the year and into 2019. Public construction demand is beginning to join the sustained recovery in private demand and Vulcan-served markets are benefitting disproportionally. "As a result, we expect aggregates shipment growth for the balance of the year consistent with that experienced in the second quarter. We also expect aggregates pricing to strengthen throughout the remainder of the year and heading into 2019. Geographic and product mix may continue to impact reported average selling prices, but the underlying direction remains clear, strongly supported by our strategic and tactical focus on compounding pricing improvements. The rate at which we convert same-store incremental revenues into incremental gross profit in the Aggregates segment should improve further in the second half, particularly as we move past the storm-related costs of 2017. In total, we project full year Aggregates segment gross profit in line with our beginning-of-year expectations, as stronger shipments work to offset higher diesel and other input costs. "The full year 2018 gross profit contribution from our downstream segments likely will fall short of our beginning-of-year plans, primarily due to the impact of much higher liquid asphalt prices on material margins in our Asphalt segment. Asphalt prices have begun to rise in response to higher input costs, and we expect material margins to stabilize in the second half of the year. "As noted, these trends continue to support our full year outlook for net earnings and adjusted EBITDA. These trends, particularly our strength in aggregates shipments supported by growth in public transportation infrastructure construction activity, also bode very well for Vulcan's continued progress toward its mid-cycle goals in 2019 and beyond." Vulcan will host a conference call at 10:00 a.m. CDT on July 31, 2018. A webcast will be available via the Company's website at www.vulcanmaterials.com. Investors and other interested parties may access the teleconference live by calling 888-599-8686, or 323-994-2093 approximately 10 minutes before the scheduled start. The conference ID is 8630268. The conference call will be recorded and available for replay at the Company's website approximately two hours after the call. Vulcan Materials Company, a member of the S&P 500 Index with headquarters in Birmingham, Alabama, is the nation's largest producer of construction aggregates – primarily crushed stone, sand and gravel – and a major producer of aggregates-based construction materials, including asphalt mix and ready-mixed concrete. For additional information about Vulcan, go to www.vulcanmaterials.com. This document contains forward-looking statements. Statements that are not historical fact, including statements about Vulcan's beliefs and expectations, are forward-looking statements. Generally, these statements relate to future financial performance, results of operations, business plans or strategies, projected or anticipated revenues, expenses, earnings (including EBITDA and other measures), dividend policy, shipment volumes, pricing, levels of capital expenditures, intended cost reductions and cost savings, anticipated profit improvements and/or planned divestitures and asset sales. These forward-looking statements are sometimes identified by the use of terms and phrases such as "believe," "should," "would," "expect," "project," "estimate," "anticipate," "intend," "plan," "will," "can," "may" or similar expressions elsewhere in this document. These statements are subject to numerous risks, uncertainties, and assumptions, including but not limited to general business conditions, competitive factors, pricing, energy costs, and other risks and uncertainties discussed in the reports Vulcan periodically files with the SEC. Forward-looking statements are not guarantees of future performance and actual results, developments, and business decisions may vary significantly from those expressed in or implied by the forward-looking statements. The following risks related to Vulcan's business, among others, could cause actual results to differ materially from those described in the forward-looking statements: those associated with general economic and business conditions; the timing and amount of federal, state and local funding for infrastructure; changes in Vulcan's effective tax rate; the increasing reliance on information technology infrastructure for Vulcan's ticketing, procurement, financial statements and other processes could adversely affect operations in the event that the infrastructure does not work as intended or experiences technical difficulties or is subjected to cyber-attacks; the impact of the state of the global economy on Vulcan's businesses and financial condition and access to capital markets; changes in the level of spending for private residential and private nonresidential construction; the highly competitive nature of the construction materials industry; the impact of future regulatory or legislative actions, including those relating to climate change, wetlands, greenhouse gas emissions, the definition of minerals, tax policy or international trade; the outcome of pending legal proceedings; pricing of Vulcan's products; weather and other natural phenomena; energy costs; costs of hydrocarbon-based raw materials; healthcare costs; the amount of long-term debt and interest expense incurred by Vulcan; changes in interest rates; volatility in pension plan asset values and liabilities, which may require cash contributions to the pension plans; the impact of environmental clean-up costs and other liabilities relating to existing and/or divested businesses; Vulcan's ability to secure and permit aggregates reserves in strategically located areas; Vulcan's ability to manage and successfully integrate acquisitions; significant downturn in the construction industry may result in the impairment of goodwill or long-lived assets; changes in technologies, which could disrupt the way we do business and how our products are distributed; the effect of changes in tax laws, guidance and interpretations, including those related to the Tax Cuts and Jobs Act that was enacted in December 2017; and other assumptions, risks and uncertainties detailed from time to time in the reports filed by Vulcan with the SEC. All forward-looking statements in this communication are qualified in their entirety by this cautionary statement. Vulcan disclaims and does not undertake any obligation to update or revise any forward-looking statement in this document except as required by law. revenues related to services, such as landfill tipping fees that are derived from our aggregates business. 3 Freight-adjusted sales price is calculated as freight-adjusted revenues divided by aggregates unit shipments. freight to remote distribution sites. 1 Represents non-routine charges associated with acquisitions including the cost impact of purchase accounting inventory valuations.